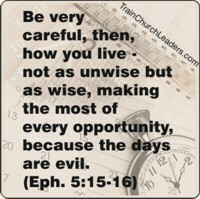 One of the key Bible verses guiding the use of our time could be Ephesians 5:15-16. This post will look at the first requirement, with subsequent posts presenting the other requirements for making the most of every opportunity. You can subscribe to this blog to receive e-mail notice of new posts. How are we going to be discerning? — by looking at life through the grid of God’s Word. In speaking of the Word, Hebrews 5:14 clearly states that it is those “who by constant use have trained themselves to distinguish good from evil.” The more time we spend with God in His Word, seeking to learn how it applies to life, the more discerning we will be. Is what I want to do God-honoring? Does it line up with God’s character and ways? Would Jesus do it if He was here? When we take the time to stop and ask ourselves these questions about how we plan to use our time, and bring what we do into alignment with a positive response to these questions, we are exercising the discernment needed to make the most of every opportunity. This entry was posted in Christ-like Priorities & Purposes .